We are all thankful to have Ryder Trauma Center in our South Florida Community. But if you or a family member end up there, it is most likely because you suffered a serious and traumatic injury. 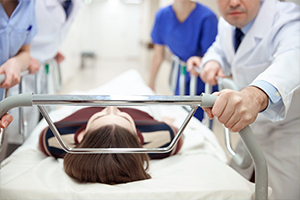 Often you will ultimately need a Ryder Trauma Center accident lawyer to help you pursue justice and full compensation. If you need help following your treatment at Ryder, call the Miami personal injury lawyers at the Wolfson Law Firm. We will meet you at no charge wherever or whenever it is best for you. Just call us at 305-285-1115 and let us discuss the ways we can help. Based in Miami-Dade County, the Ryder Trauma Center has been serving the community since 1992. Serving both adult and pediatric care, the Ryder Trauma Center is part of the Jackson Health System, a nonprofit system which delivers medical care through several hospitals in the Miami-Dade area. The Jackson System includes Holtz Children’s Hospital, Jackson South Community Hospital, and several others. The Ryder Trauma Center itself is a Level 1 trauma center, meaning it gives the highest possible surgical care for patients who have suffered major trauma. All too often, the worst of all injured people end up at Ryder Trauma Center in Miami-Dade County. The types of accidents or incidents that cause people to be taken to Ryder vary. But sometimes people get hurt while they are being treated or visiting at Ryder. If you were seriously injured in any form of an accident Ryder, then you are encouraged to call the Ryder Trauma Accident Attorneys at the Wolfson Law Firm in Miami. There is never any obligation and the consultation is free-of-charge. There is never a fee unless you recover compensation. Call us at (305) 285-1115 and speak with a Ryder injury and accident lawyer today. At the Wolfson Law Firm, our personal injury lawyers in Miami-Dade County are ready to help you. Call us at (305) 285-1115 and let us get to work for you. The Miami accident attorneys at the Wolfson Law Firm serve the fine people of South Florida since 1963 including the towns of Kendall, Hialeah, South Miami, Kendale Lakes, Coconut Grove, Florida City, Coral Gables, Liberty City, Miami Beach, Overtown, Cutler Bay, Miami Shores, The Hammocks, Westchester and Doral.